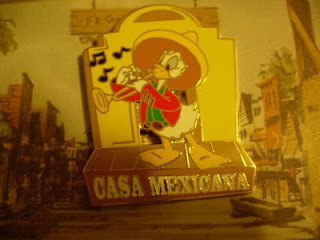 This is a "Casa Mexicana" Pin from Disneyland. It features Donald Duck as a Mexican musician. This pin is a Disneyland Annual Passholder Exclusive Special Edition of 10,000. Casa Mexicana was a restaurant in Frontierland at Disneyland which had previously been opened as "Casa de Fritos" back in 1955. 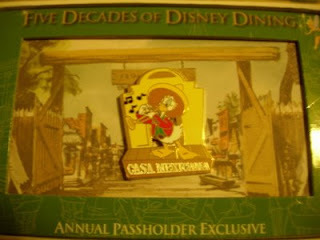 On October 1, 1982, the restaurant was re-opened as Casa Mexicana. In 2001, the restaurant was completely re-themed as "Rancho del Zocalo". This restaurant has always served Mexican food.